Hey guys, this has been months in the making and I’m happy to finally share it with you all here. I’ve gone through every single level and devised a contract for every single reasonable sniper location in the game (including Legacy) where you can kill 4-5 targets and still get Silent Assassin, all without leaving the sniper spot (apart from escaping, obviously). UPDATE: The latest patch (27-02-19) has made it impossible to get cannon kills using just a sniper rifle, meaning “Sniper Assassin: Isle of Sgail” will now have to be SA’d in a different way. Another great deliver by Australia’s strangest PM. Thanks! Cheers, let me know if they lived up to your expectations, and if you had any issues! Just got one a day or so ago, thought it was time! I’ll wait for the definitive GOTY version. You can now play all contracts on Xbox!!! Nice contracts, the problem is Sniper works different in Sniper assassin mode, in normal mode you can’t lure people properly without them getting suspicious, sometimes they don’t even go to see it, or just start running, it’s really annoying. This is true, but I’ve specifically picked targets that can be lured with just the one shot (including one shot + a car alarm, which does not count as a second shot). 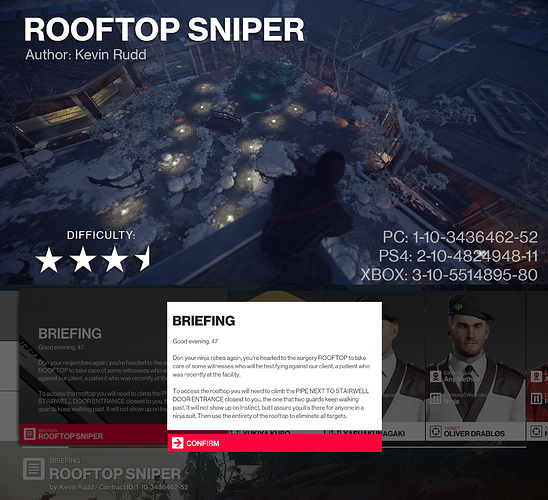 There is only one target in all of these contracts which has to be put into “Searching” mode to be lured away, and that is in Sniper Assassin: Paris, and I’ve replicated it multiple times and it can be done if you’re patient and wait for him to slowly explore the area and go behind cover. And a BONUS of having different rules to the Sniper Assassin game mode is bodies are allowed to be found from accidents, which is a huge positive. UPDATE: All contracts are now on Xbox, I have updated the contract ID post up above. Give me your feedback and feel free to post any playthroughs! For those bored and wanting another sniper contract, today I learned of an easter egg that gets you onto the GAMA rooftop, so I made a contract out of it. Read the briefing to figure out how. If you follow the rules and actually snipe, the mandatory complications won’t be a problem for you, you just have to make sure no one sees the bodies (Remember, there are cameras)! Really enjoying playing these on Xbox! @KevinRudd I thought the school yard one was brilliant as far as distracting 2 of the targets and making use of the environment, despite the fact that the other 3 targets were pretty simple. Landslide was fun, and I still haven’t managed to complete Bangkok or Sgail. Great work!